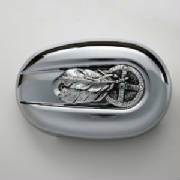 Fits 2004-Up Sportster® air cleaner covers. Includes stainless steel allen head bolt and cap. Air cleaner cover not included. Native American Medicine Wheel air cleaner cover insert for 2004-Up Sportster® in Marine Grade aluminum polished to a mirror finish. Stainless steel allen head bolt and chrome cap included. Air cleaner cover not included.